In addition to being a wildly successful fencing coach, Laurie Schiller is an expert in African history and a Civil War reenactor. The colorful character has led Northwestern’s program from club-level to national power. Welcome to The Sideline, a series of profiles of Northwestern’s coaches where The Daily’s sports staff provides detailed looks into the lives and personalities of all 19 varsity coaches. Laurie Schiller was born to teach. The son of two teachers, Schiller came to Northwestern to earn his doctorate in African history. After completing his dissertation, he planned to find a job as a university professor. But he ran into one problem: the job market. That’s when a golden opportunity presented itself. Had Schiller worn a different jacket on his first registration day at NU, his life might be completely different. Schiller, now 63, earned his bachelor’s degree in African and Afro-American studies from Rutgers University in 1972, where he served as co-captain of the fencing team. Next, he moved to NU for his Ph.D. While waiting in line at Patten Gym to pick his classes, a French Kellogg student in the fencing club took note of his Rutgers fencing jacket and asked if he wanted to join the team. But the “team” was pretty much non-existent. It faced extinction when Hungarian coach Charlotte Remenyik left to lead Ohio State’s women’s team, but Schiller saved the fencing program when he took it over in 1978-79. Schiller only planned to coach until he received his degree in 1982, but when no other jobs presented themselves, NU made him the best offer. The University would allow him to stay as an adjunct professor as long as he continued to work with the fencing team. Schiller decided he’d see what he could make of the position. Although coaching fencing was never in his plans, he enjoyed success early in his career and was having fun. After all, coaching is a form of teaching. And it’s Schiller’s skill as a teacher, not his fencing abilities, that make him a good coach. Schiller does not believe in yelling and screaming. His philosophy is to treat his players with respect and to listen to what they have to say. He knows he’s coaching experienced fencers, and he takes a positive and supportive approach to fixing their mistakes. It’s not surprising he cites Nelson Mandela, Martin Luther King Jr. and Abraham Lincoln as some of his idols. And clearly Schiller’s calm approach has worked. 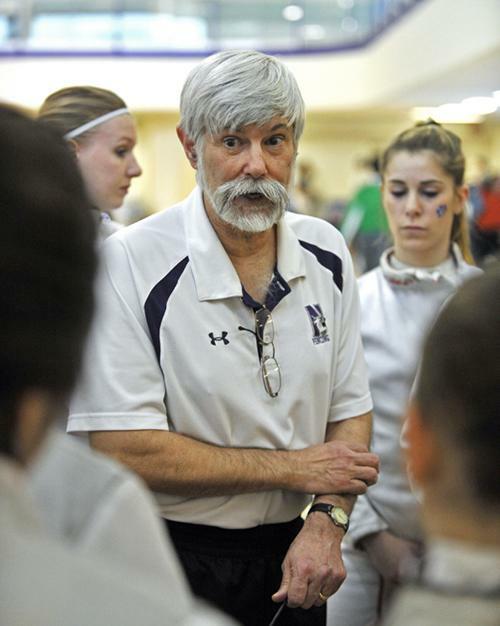 He has 1,183 career wins— the second most of all-time by any fencing coach (behind only North Carolina’s Ron Miller). “It’s odd,” Schiller said of having so many wins. “It just sort of happens. You work and you work and you win matches, and the numbers pile up. But it’s a number. Yeah, when I look back, I go, ‘Wow that’s pretty amazing, I have over 1,150 wins.’ Not too many people are able to say that, so that’s pretty cool. Fencing was what the University called a “varsity-club” sport when Schiller started. NU faced intercollegiate Division I opponents but had no scholarships to give, making it difficult for Schiller to recruit top-level talent. Even so, both the men’s and women’s teams thrived under his guidance. The men went from 4-11 to 21-6 in three years, and the women have only had one season below .500 in 36 years (in 1987-88). But Schiller did not exactly have the resources of a renowned team at his disposal. The job wasn’t even paying him for the first three years. It was in the 1990s that everything changed. In 1994, the University downgraded its men’s team from varsity to club for economic reasons. Then in 1998, NU allocated scholarships to its women’s team. This meant Schiller could now recruit higher-level fencers. But scholarships also meant coaching had to become a full-time gig. Schiller no longer had the time to both coach and teach. He had to spend far more time on the road recruiting. “After 25 years of teaching in the history department, it got kind of old grabbing a bunch of blue books and heading off to Penn State,” he said. Since Schiller’s decision to devote all his time to coaching, his squads have consistently been some of the best in the nation. The Wildcats have finished in the NCAA top ten for the past 15 seasons. Additionally, Schiller’s accolades have piled up over the years. He has been named Midwest Fencing Conference’s Coach of the Year nine times and United States Fencing Coaches’ Association Coach of the Year twice, in 1998 and 2004. He is currently serving his third term as one of the eight members on the NCAA Fencing Committee and is a Fencing Master, or Maître d’Armes, the highest certification to teach fencing, since 2002. Schiller has a career record of 1,183-446, a .726 winning percentage, and a women’s record of 926-270, and he led NU to three straight Midwest Fencing Conference titles from 1999 through 2001. Being an NCAA fencing coach is a pretty unique profession in itself as there are only 24 Division I programs in the country. As a fencing coach and an African historian, Schiller is one of a kind. Still, that’s not all that distinguishes him from your average Joe. With his bushy white beard and mustache, Schiller looks like he stepped out of a time machine, straight from another era. But there’s one place he blends right in: the battlefield. Schiller brings his love of history with him to the field, putting on as authentic a performance as he can. War and strategy have fascinated him since childhood. Schiller is a big fan of reading and learning, and although he no longer works in Weinberg’s history department, he still teaches in the Alumnae College, non-matriculating classes for adults at Norris University Center each quarter. Schiller loves this gig, as there is no homework or papers — only fun. The adults who attend these classes are there because they want to hear him, and he’s there because he wants to lecture. It’s a win-win. This past winter, Schiller taught about the history of South Africa, and he has a course on World War II planned for next year. And Schiller’s experiences do not end there. Raised in a socially liberal household in Roslyn Heights, New York, Schiller marched in Civil Rights demonstrations in 1964 when he was just 14 and protested in the Vietnam anti-war movement in the 1970s. As for fencing, Schiller started in high school because his older brother, Lanning, was on the school team. “I think it was more just sibling rivalry than anything else,” he said. Schiller fenced foil in high school and college, but as a Fencing Master, he is trained at the highest level to coach all three weapons. And Schiller has turned fencing into a family event. His wife, Cathy Weigley, has served as the team armorer for the past 35 years. She works upstairs in Patten fixing all the team’s weapons. Schiller and Weigley met in Swahili Club at NU when she was a graduate student in anthropology, and he was one in history. In August, they will be married 40 years. Schiller said he loves just about every aspect of his life. Although he stumbled into coaching by accident, he appreciates every second of it.